Another underwhelming Thursday Night Football matchup on paper, Indianapolis-Jacksonville had its saving grace: it was, somehow, the first and only national game this year for Andrew Luck and the frisky Colts. They didn't disappoint, having their way with the Jaguars. Which is all well and good for anyone who isn't a fan of those sacrificial cats, who had to endure an early blowout followed by a Blaine Gabbert injury. 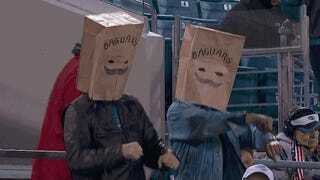 Bags, Gangnam Style, Chad Henne. Is it the 2013 Draft yet?